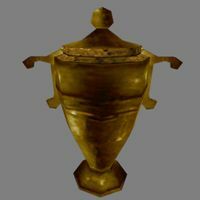 The Bittercup is an artifact located in Ald Redaynia, attributed to the Daedric prince Clavicus Vile, whose sphere is the granting of power and wishes through ritual invocations and pacts. When you activate it, you will be asked if you would like to drink its "nectar" or pick it up. If you choose to drink, the cup will disappear. This will interfere with the Thieves Guild quest line, specifically The Bitter Cup. If you drop the Cup, you will be given the options again every time you pick it up. Drinking from the Bittercup will permanently increase your highest attribute by 20 points and decrease your lowest attribute by 20 points. However, no attribute will be raised above 100. Something to note is that the minimum and maximum attributes are checked sequentially, in the same order that they appear in the stats menu. Therefore, if you have several attributes at the same level, the first one in the menu will be chosen. It is possible to control which attributes are affected using Fortify and/or Drain Attribute effects. The Bittercup affects the base attribute value, so fortifying an attribute above 100 temporarily will not prevent the effect. However, it is still not possible to raise an attribute above 100, nor avoid having an attribute lowered by 20 points by draining it to zero. The name of the artifact is spelled as one word, Bittercup, but is referred to as the Bitter Cup everywhere else, including the dialogue that asked when picking it up. Another copy of the Bittercup can be found in the ToddTest test cell. Agility, Endurance, Personality, Speed. This requires the player to pick, respectively, Bosmer for Agility, Khajiit, Dunmer or male Argonian for Speed, Imperial for Personality and Orc, Redguard or male Nord for Endurance and then select the the Birthsign with the desired attribute fortified by 25 points as well as picking it as one of your two governing attributes during class creation. Drinking the Bittercup afterwards will result in a permanent 100 points in the desired atribute. This will however result in a net loss of 5 attribute points as no attribute can be raised past 100 and there are no 20 point fortifications from birthsigns. This page was last modified on 29 November 2018, at 16:28.